This feature in ClickUp is revolutionary for task management. And when we say “task management” we don’t mean just generic software with a list. We mean the act of managing, creating and editing tasks. But let’s rewind a little bit. ClickUp was created out of the frustration of having to use way too many apps across organizations. Part of that frustration was how we had to interact with project management apps as well. And that includes how many ‘clicks’ it took to get from one project to another, to switch between this task to another. We’ve simplified that in so many ways, and with /slash commands we go back to our roots. 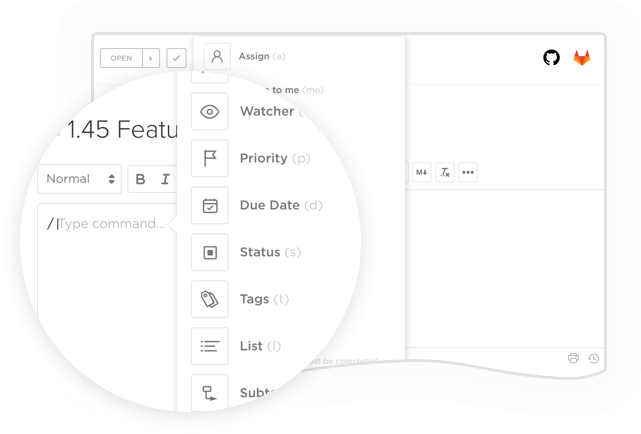 Now, anywhere within a task, you hit the ‘/’ slash key, opening up a wide menu of options for you to choose from. Start typing one of these shortcuts and do everything faster. ClickUp reduces any friction that gets in the way between you and ultimate productivity. Slash commands are an industry game changer that can help you immediately. Start typing in a comment, task description or from a new task in a List to utilize Slash Commands. See even more shortcuts in this help doc. Because our goal at ClickUp is to really rethink project management from the ground-up, giving the whole industry a fresh perspective on what can be done. We want to bring a new breath of fresh air to an otherwise boring and monolithic playing field. And /slash commands does just that. It’s an out-of-the-box feature that we’re sure you’ll love and won’t find anywhere else. It’s revolutionary to the industry and we’re ecstatic to share it with you. We might even change our name to ClickLess. You’ll never use your mouse again.